It’s hard to write about Hanoi without getting sugary sweet with the superlatives. Romantic, charming, picturesque, beautiful – they’re all words easily used to describe Vietnam’s capital city, and they’re all deserved. Crowded, frenetic and noisy could all equally apply too if you were being strictly accurate – but Hanoi has a distinct charisma that makes visitors tend to fall in love with the city despite its faults. It’s become one of my favourite cities in South East Asia and led me to return there several times over the last 3 years. Much of Hanoi’s charm comes from the compactness of the city’s central district. Hanoi is a great city for walking in because most of its main sights are all within the same area. The city radiates out from Hoan Kiem Lake, with the Old Quarter on one side and magnificent French colonial buildings on the other. The lake itself is the social focal point of the city – it’s lined with trees, a wide pedestrian boulevard, benches and cafes all the way around, making for a glorious space to socialise and enjoy the day. Hundreds of Vietnamese gather at the lake at dawn each morning to do the day’s tai chi exercises; hundreds more courting couples gather at the lake at night on the benches and on the back of their parked motorbikes to take in the city lights reflecting on calm lake water and the lit up temple in the lake’s centre. Saigon may have been called the “Paris of the East”, but in terms of romance, Hanoi wins hands down. If you’re looking for an unusual honeymoon destination, this could well be it. 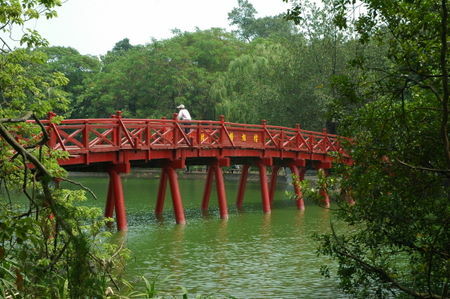 For tourists, Hoan Kiem lake is unsurprisingly a great place to wander at different times a day for people watching – moreover, it also makes it easy to orientate yourself in the city depending on your position by the lake. It’s not quite so easy to orientate yourself once you disappear into the historic narrow maze of roads above Hoan Kiem Lake known as the Old Quarter. This is the bustling heart of Hanoi, with each tiny street dedicated to a specific craft, like shoemaking or metalwork or even masonry for tombstones, for the last four hundred years. It might be a Communist country, but individual enterprise is alive and well on the streets of Hanoi. In the Old Quarter, life takes place on the pavement – it’s here that business is conducted, friends are greeted and families gather to eat together, sitting on the small plastic stools that are ubiquitous in Hanoi. It’s here you’ll see the vendors wearing the iconic conical hats and carrying impossibly large loads balanced on their shoulders, while scores of tiny shophouses compete for your attention with beautfully prepared displays of silk, lacquerware and paintings. 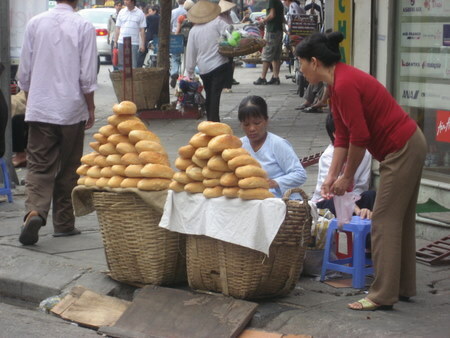 Basic English is widely spoken in Hanoi, so haggling and bargaining is no problem. Same goes for ordering at restaurants and checking in at your hotel. Just remember to speak clearly and concisely, and to be polite and goodnatured. A smile helps things go a lot smoother. 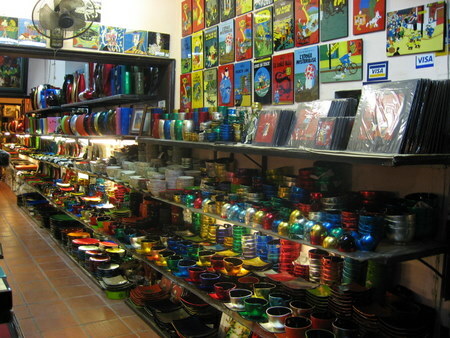 The return of tourists to Hanoi over the last decade since the stuttering advent of Doi Moi in 1986 (economic liberalisation, or literally, “renovations”) has also meant a flourishing of Vietnamese arts and crafts for tourists to purchase too. Hand made suits, shirts and all manner of other clothes are also available at bargain prices, but make sure you leave time for plenty of fittings. 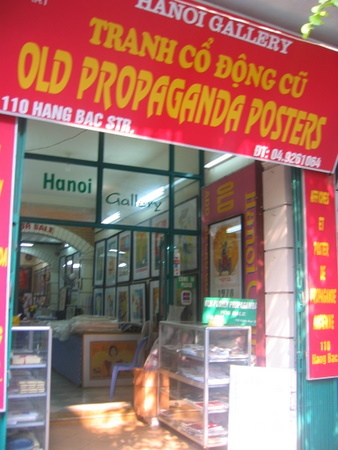 My own personal favourite shop in Hanoi is the propaganda poster shop on Hang Bac, where you can browse and buy thousands of posters from the American War, as it’s known in Vietnam. It’s a fascinating and sobering experience to see these original relics from the conflict. 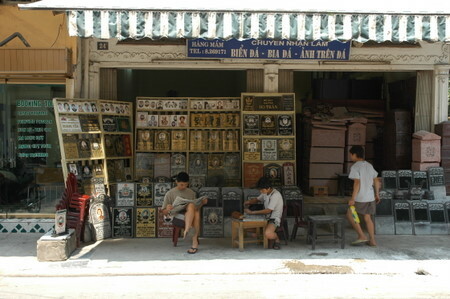 [You can read more about the propaganda poster shop in Hanoi in my separate article]. Amongst the shops are some superb restaurants, although you might want to avoid eating at Cafe Dung. There are few Western brands readily available in Hanoi – there’s no McDonalds or Starbucks, but you won’t really need them. Vietnamese cuisine is possibly even more delicious than Thai food, and some restaurants retain the culinary influence from France’s nearly century long colonisation of Vietnam, fused together with a Vietnamese twist. If you like good food, then Hanoi is an essential destination. Cha Ca La Vong is a Hanoi institution, serving only one dish – the Vietnamese speciality that is Cha Ca, an exquisite fish dish. Green Tangerine on Hang Be is in a palatial old building with its own courtyard, complete with spiral staircase, and serves excellent 2 course set lunch menus for an unbeatable $US 6. 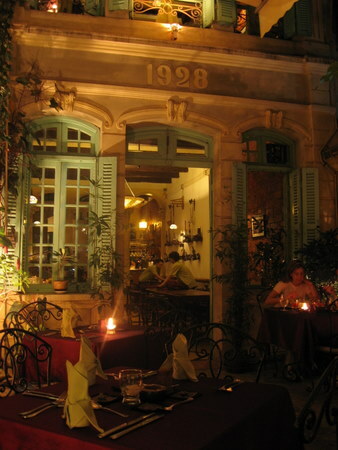 (See my list of Favourite Hanoi Restaurants for more suggestions). The French influence is also apparent in two of Hanoi’s local brews, 333 and Halida, which are excellent, crisp beers, definitely more palatable than the dirt cheap but rough as guts Bia Ha Noi. By Western standards, Hanoi is cheap. The amusingly named local currency, Vietnamese Dong, is used simultaneously with US Dollars in Vietnam. You can get a decent guesthouse room in the Old Quarter for around $10 a night or be cocooned in French colonial splendour at the Hanoi Sofitel Metropole for $250. In between these two ends of the spectrum, there are scores of other hotels. I’ve included some personal Hanoi hotel experiences and recommendations in my Hanoi Hotels article. Food and drink are similarly good value too, especially given the quality of cuisine available, and the low prices of the Vietnamese handicrafts mean that it’s pretty hard to not go shopping in Hanoi. Economic liberalisation has also brought a flood of new vehicles into Vietnam – Hanoi is the city of the motorscooter. There are literally thousands of little Honda Dreams on Hanoi’s roads at any one time, and the sounds of their motors and the tooting of the horn to signal presence rather than alarm is a perpetual backdrop during any visit to the city. The traffic flows endlessly and constantly and you need to keep your attention on what’s going on around you, especially when you are in the Old Quarter. With over 1.5 million motorbikes in Hanoi alone, crossing the road is not for the faint of heart. Bikes will pass within an inch of you as a matter of course as you stroll the narrow streets. The trick is to remember that the traffic flows like water and so will move around you, provided you don’t make any sudden moves. (That includes panicking). At first the traffic can be quite an assault on the senses, and adds a frenetic, noisy edge to the city, especially as the traffic treats Hoan Kiem Lake as one big roundabout around which it moves day and night – but it’s surprising how quickly you become to used to it. 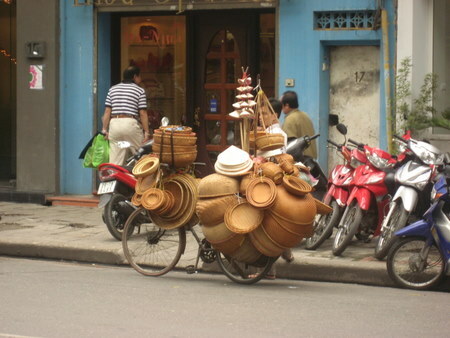 You will also see some amazing sights of the stuff Vietnamese manage to load onto their bikes. On the way in from the airport, I saw a little Honda Dream loaded up with four full grown trussed up pigs, two slung on the side and two stacked on the back, riding pillion behind the driver. In the city itself you regularly see motorbikes and pushbikes impossibly loaded with wickerware, housebrushes, balloons and almost anything else you can imagine. Hans Kemp’s brilliant photobook, Bikes Of Burden, is an awesome document of the different uses to which these bikes are put – it must have taken him months to get all these different snaps. Dodging the traffic, strolling around the Lake, exploring the Old Quarter, shopping and enjoying great food pretty much sums up my Hanoi experience. It’s a great city to kick back in after travelling for a while – being in Hanoi is more about wandering around soaking up the atmosphere than ticking off the sights. 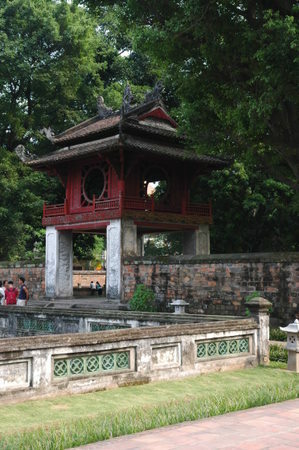 If you want to go beyond the Lake and Old Quarter, Ho Chi Minh’s mausoleum and the nearby museum are important stops if you’re interested in Vietnam’s history, and the Temple Of Literature which is a cyclo ride away from the Old Quarter is a stunningly beautiful Confucian shrine. Right by the Temple is the excellent restaurant Koto, which serves delicious Vietnamese food made and served by former street kids who’ve trained within the Koto program to become restauranteers. Therefore, by stuffing your face at Koto with as much food and booze as you can manage, you are actually giving to a good cause. Gluttony rarely has such a great justification. After visiting the city four times, a question I keep asking myself is, why do I like Hanoi so much? It’s very pretty, to be sure, but there are many places in Asia and the world that are pretty. Partly it’s because I don’t get bored of seeing the Old Quarter – it’s a genuine magical place that, while becoming undeniably touristy, is still very much part of the daily life of the local Vietnamese. There is something about the tall thin houses that make up the Quarter and the sunshine that usually bathes the city that I simply haven’t seen anywhere else. (Yes, you can get different types of sunshine). But I think the main reason I keep going back to Hanoi is because I love the sense of optimism that pervades the city. It’s hard to believe that only 20 years ago Hanoi was poverty stricken and in near-terminal decay thanks to the disasterous Soviet-era economic policies of the Communist government. Since the advent of Doi Moi, and despite the setbacks of the 1997 Asian economic crash, Hanoi has flourished, and it’s also has a very young population – something like half the population is under 30, and that sense of optimism means there are a lot of kids being born too – or maybe it’s just the romance of Hoan Kiem Lake causing the baby boom. Either way, Hanoi is looking towards the future, and the only problem it has now is the same one facing so many Asian cities – how to get bigger and grow the wealth without destroying the uniqueness of the city itself? Already cars are beginning to appear more frequently on Hanoi’s roads, utterly unsuited to the city’s narrow streets but still a status symbol that needs to be paraded around. The centre of Hanoi was spared bombing by American forces and it hasn’t fallen to the demolition ball either in the sprint to modernise – hopefully the attraction of the Old Quarter for tourists will mean it continues to be preserved, although it’s far from certain. Hanoi twenty years ago was in terrible decline while now it’s on an inexorable rise that could wreak equally huge changes on the city. You only need to look at Beijing’s eradication of its historic and picturesque old quarter in the run up to the 2008 Olympics to see there is sometimes little civic sentimentality about these old buildings. For now, however, Hanoi is a crucible of change that, while rapidly evolving, will probably still remain the city I’ve come to know for at least the next 5 years or so. Go see it now before it begins its next revolution.